Well designed window treatments, like anything else, take time to get right. I find this especially true when designing for modern and industrial spaces where less is usually considered more. Recently, I had the pleasure of designing window treatments for a living room in a modern loft with 11-foot ceilings. The client wanted a true industrialist look: brick walls, faux-concrete venetian plaster, and long flowing linen curtains (the works!). However, simply installing ready-made curtains proved to be difficult because of a few existing conditions. The 1st issue was the most glaring. I noticed the radiator was slightly wider than the window itself. This meant you could not close the curtains - essentially making them purely decorative and not functional. No bueno :-/ Another issue was the limited wall space on the right side of the right window. The curtain panel here could not be very thick, otherwise the folds would block part of the window and restrict natural light. The last issue was the ceiling beam in between the windows. This came to mind because my initial thought was to install one extra-long curtain rod across both window. However, this look could not be achieved because of the beam, so the curtains would need to start just below it. Here's what I mean by one extra-long curtain rod across two windows. Since installing curtains panels alone was not practical, I decided to explore shade options - specifically what's called a relaxed Roman shade. I liked this traditional option because it would soften the otherwise very boxy room, and the client wanted something with a romantic look. I created a quick rendering to see how the relaxed Roman shades would look on the windows. While I liked the clean silhouette of these shades, they would not provide the drama the client wanted. Another thing I considered was that custom shades cost about twice as much as ready-made curtain panels. It didn't seem worth the cost without the wow-factor effect. 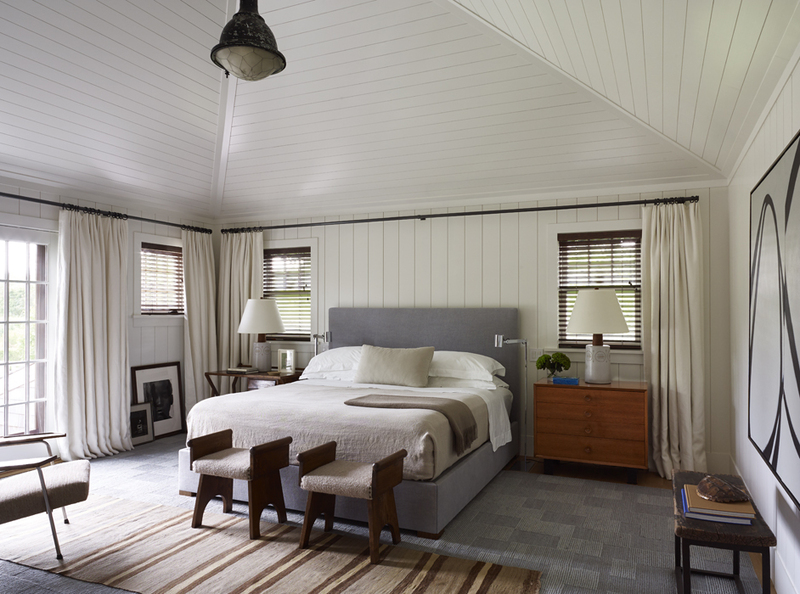 I've always loved the look of shades installed beneath curtains, which offers the best of both worlds: functionality of shades, and the drama of curtain panels. However, I had really only seen this type of installation in more traditional style rooms. I wasn't sure if it would work in an industrial design; That was, until I found this inspiration photo, complete with a brick-wall. Eureka! Because of the long wall, and large space between the slightly narrow windows, I decided installing two curtain rods would be best. I also felt that these windows called for two pairs of panels to create balance and distract from the fact that one of the panels would have to be slightly scrunched up because of limited space. I went with a hotel style, self-return option from Restoration Hardware because of the limited space on the sides of the window. I also like the cast iron material and simple design - a modern take on industrial pipe hardware. For the curtains I selected a sheer linen, also from RH, in a light grey color. I love the look of dark grey or chocolate brown roller shades. This type of shade is less expensive than fabric Roman shades, and creates a very modern, airy look. I went with a chocolate brown option from my go-to source Smith & Noble. And when it's all combined you get: function & form, industrial & modern. Mission accomplished :D Notice how the shades are mounted outside the windows and installed at the same height as the curtains. This is a visual trick to make the windows appear taller! 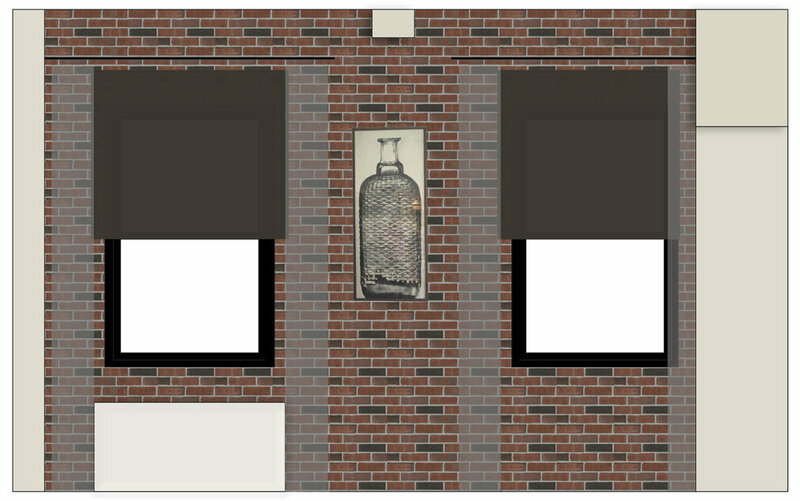 Stayed tuned for photos of the brick and window treatment installations, coming soon!